Make the most of out your office storeroom or home bomb shelter space by adding storeroom racks in it! Our boltless racks are suitable for both home and office storerooms racks. Designed with safety in mind, each level holds a minimum of 250kg up to 600kg of evenly distributed loads depending on your configuration! For more information, you can check out our mini-site dedicated to boltless racks. Our heavy duty boltless storeroom racks have a capacity to hold loads up to 600kg per shelf of uniformly distributed load! The picture features an L-configuration storeroom racking without a blocking centre post to optimise your storage space. Available in metal and fibreboard. Our boltless storeroom racks are produced with quality in mind, with that, we have converted what used to be industrial racks into sturdy and safe racks for homes! With our strong warehousing equipment background, our storeroom racks are designed to be “installed & forget” thus they are rated from 250kg up to 400kg. Definitely an overkill for any home but that’s the way things are built to last! What is a boltless rack? Traditional storeroom racks are designed with a universal L bracket strip and fastened together with a bolt at the front and nut behind. You might notice it from the image below. While this might have served its purpose there are some racks that unfortunately that do not stand the test of time and collapse because of a loosened nut or overloaded shelf. Boltless racks are designed in such a way that it can be built up without using and bolts. 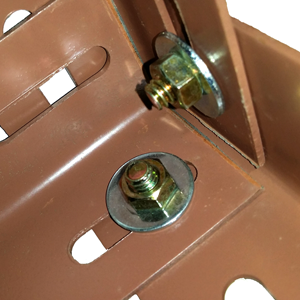 By removing the nuts and bolts from the design, the rack is now easier, faster and safer to build. 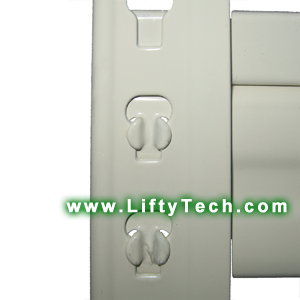 Safer because you never need to worry if the bolt and nut have loosened over time. Not only is it easier to build, it is also easy to reconfigure. If you need to resize your shelf, all you need is a mallet and 5 minutes! No more fumbling with nuts, bolts, screwdrivers and spanners! Just take a look at the back of the traditional bolted racks. There are 2 nuts for each post in an awkward and are hard to reach. Imagine if you have reconfigured the shelf size and realised it wasn’t big enough! No problem on a boltless rack, it gets reconfigured again in 5 minutes, try that with the tradition bolt and nut racks with 8 nuts. Levelling is never an issue. With our unique slot in design, your shelf is always flat and level! 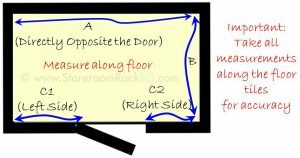 Take the measurement of your storeroom from the floor. This gives the most accurate reading. Make sure that your desired storeroom rack is at least 2cm smaller than your measurement. 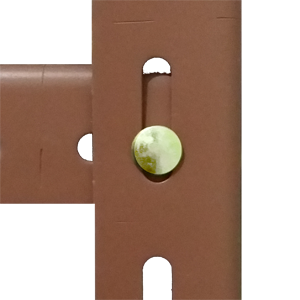 We are a boltless rack supplier and stockist with our warehouse full of racking parts. You are guaranteed of fast response and installation times because we keep our own stocks and supply them to many contractors in Singapore. 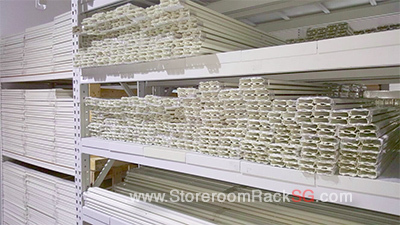 Many can claim that they are getting ‘direct from the factory’ or ‘factory-direct prices’ but there are no boltless racking factories in Singapore! Drop us a visit (other than lunchtime “lah“) and see for yourself and be the judge! Over time, as you pile your rack with your collections, the storage rack just gets heavier, why risk a rack collapse because of an untested rack? Get a heavy duty rack and live with peace of mind that your rack will never fail you. Think all racks are the same? You have never seen a collapsed rack before.